We Search Trusted Retailers DAILY to find you the best deals on Sat Navs and the latest Sat Navs sale to save you money. Getting hold of a cheap Sat Nav is still something that's worth buying, even with the decline in demand since the march of the smartphone. Sales in Sat Navs have been dropping for a number of years now, but this has led to manufactures bringing out more features than google maps, and other smart phone navigation apps and also, bringing down the cost of a Sat Nav unit. So let's look at the features you can get from a quality cheap Sat Nav system and compare then to a smartphone navigation app and see if its worth while getting one, and how much you want to be spending. How Much Should a Quality Cheap Sat Nav Cost? Sat Navs can range from £50, all the way to £300 and over. There are a lot out there in-between that price range though. The big name brands like TomTom and Garmin might go for a bit more than the budget models, but they are usually better maps and guidance system. The base models for these brands usually come in around the £100 mark. 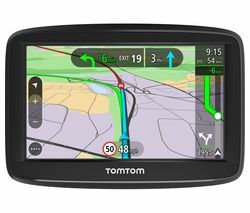 So to get the best value for money and if it's just a cheap sat nav you're after to keep in your car, we would recommend getting a TomTom or a Garmin base model as these are really good for this type of use. If you do a lot of driving and also use bluetooth and other hands free systems, then you may want to pay more and get the better equipped sat nav. You could even pump a little more in and get a dash cam, with built in sat nav. Be ready to pay close to £400 for this set up though. Minimum 4.3 Inch Screen There is not much point in buying a sat nav that you can barley see, so when shopping for now, make sure that the screen size is at least 4.3 inches. This is the smallest we would recommend, but it's always better to go bigger if your budget can stretch to it. 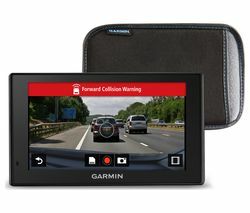 Most of the Garmin and TomTom sat nav come in at the 5 inch mark, but if you are looking for a 6 inch sat nav system, then you should find a good brand one for around £150. Free Map Updates This is were some of the cheaper brands can prove to be not great value for money. They may charge you to update the maps, or not have the capability to update the maps at all. 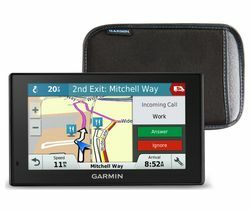 The Garmin sat nav and TomTom ones all have updatable maps, but you should make sure they are free to download of WiFi. Most are, but it's worth checking. UK, Europe and WorldWide Maps This is a feature that only you can decide if it's worth the investment or not. If you do no driving anywhere but the UK, then clearly don't bother. If you go away once a year and drive abroad, then you'll know rental car companies can charge a lot to hire sat nav systems, so having your own, might be a good idea. If you do a lot of overseas driving then we would recommend you get this feature. BlueTooth Phone Connectivity Being able to connect your phone to your sat nav is exactly a necessity, but its a great feature to have if you have the budget for it. Getting a sat nav with bluetooth allows you to see who is calling, or texting and to call them back using hands free, and even voice calling, so keeping in line with the rules of the road. Pinch and Zoom Screen This is a handy little feature to have when driving round small roads in towns and cities. If the streets are all looking a bit squashed together, you can zoom in and get a better idea of where you are and where you're heading. Tap and Go Most sat nav that have the pinch and zoom feature also have a tap and go feature too. It's basically like it sounds. Tap on the screen of your destination, and the system will guide you there. On Map Features You on map features should be current speed, time of arrival, speed limit, distance to destination and distance to turning. These are the basic features and if not present, then we suggest getting a better model sat nav. 3D Map Display The 3D map display gives you a better view of the road layout in front. This view isn't always to everyones taste, but its good to be able to have it so you can decide for yourself. Traffic Updates We can all see the huge benefit of getting this feature on our sat nav. Avoiding the traffic on a drive home is a god send. Other Updated On Route Information As well as traffic updates, sat nav can also give updates on a number of other things to. Such as accidents, diversions, real-time community updates and the weather. Not the most important feature out there to have on a sat nav systems, and doing without it might save you a few quid. Speed Camera Alerts Getting a sat nav that will alert you to a speed camera is great for avoiding fines, but also vital for adding a bit of safety to you driving as speed cameras are often put in place that speeding can be dangerous. We've already touched on the best brands of sat nav, but lets go through all of the ones you can find at Argos, Halfords and Currys. Tyre Pressure Monitor Only found in the Snooper brand of sat nav and you'll be paying for it too. But having this feature can be a great added safety bonus as it will tell you if your tyre pressure is low. 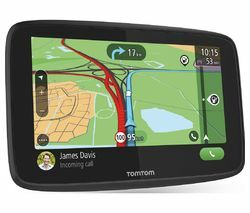 TomTom Sat Nav These guys are one of the biggest names in navigation systems and they have been in this game for quiet some time now. They have large clear screens and world wide maps. They can be a little more expensive, but if you can afford it, then we think they are well worth the extra investment. 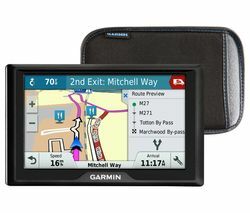 Garmin Sat Nav Like TomTom, Garmin are also a massive navigation system brand. They don't have quite as many different models to choose from, but still have ones at the lower end, and at the higher end too. They have one of the largest screens you can get on sat nav systems, a 7 inch screen is great for giving you a far better view of the road in front of you. Binatone Sat Nav Binatone are a really low priced brand of sat nav. That isn't to say they are not that good. If you don't do much driving and just want something as back up in your car incase you end up going somewhere you're not sure, then a cheap sat nav like this will be more than good for the job. Snooper These are a new brand of sat nav and they only have a couple of models. They are really good quality and at very competitive prices too. We love the Snooper Pro SC5800 for it's clear crisp screen and simple navigation settings. These are the best brands of sat nav to suit all budget types. Shopping for them at Argos, Currys and Halfords is a good way to make sure you find the cheapest deal on the sat nav you want. We think these stores do the best sales on electrical too, so you may even get a top of the line sat nav systems in the sales. This is a great way to get great value for money on your cheap sat nav.